Blood oranges were on special in my local market the other day and I got a great deal on some of the particularly colorful Moro variety. 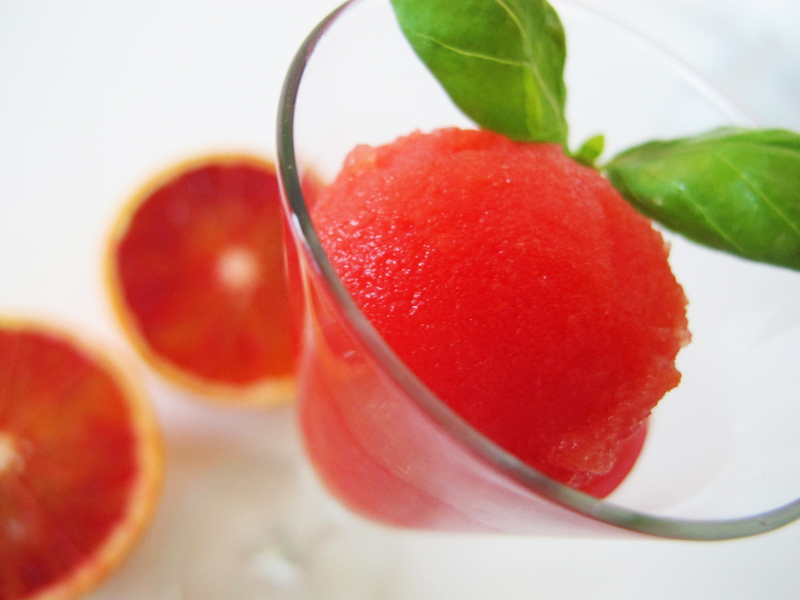 The vibrant juice makes a stunning vermillion-colored sorbet. In thinking about what to pair with the blood oranges I remembered the lavender that has been burning a hole in my cupboard for a while so I took the opportunity to use some of it up. 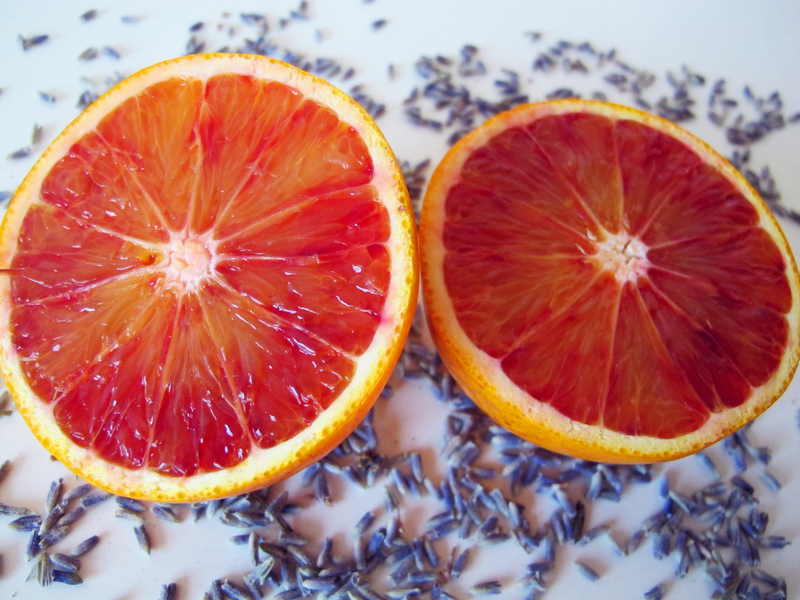 Lemon juice enhances the flavor of the blood oranges, a tad of honey adds another dimension of flavor, and the lavender provides a distinctive floral accent. The sorbet base should be fairly sweet since once it’s frozen the sweetness will be less intense. I suggested a range of sugar to account for differences in the sweetness of the fruit. Taste it as you go and adjust the sugar accordingly. Adding vodka keeps the sorbet from becoming too icy and hard but it can be left out. Be sure to take the sorbet out of the freezer a few minutes before you plan to serve it so it will be easier to scoop. 1. Zest two of the blood oranges directly into a small, non-reactive saucepan. 2. Roll the blood oranges and lemon on the counter firmly with your palm to break down the juice sacs and make it easier to extract more juice. If you have a juicer or a juicer attachment for your food processor this is the time to use it. Continue juicing the oranges until you have 4 cups (1 liter) of juice. Add the lemon juice to the blood orange juice. 3. Put 1/2 cup (120ml) of juice in the pan with the blood orange zest. Add the sugar and honey. Heat, stirring well, over medium-high heat until the sugar dissolves and the mix has come to a simmer. Remove from the heat and add the lavender. Cover the pan and let steep for 30 minutes. 4. Strain the steeped mix back into the reserved juice. Discard the zest and lavender flowers. Taste the sorbet base to ensure it is sweet enough before continuing. If you need to add more sugar, take another 1/2 cup (120ml) of the sorbet base, add sugar accordingly, and reheat it in a saucepan until the sugar dissolves. Once you have the level of sweetness you prefer, add the vodka and continue with the recipe. 5. Let the mixture cool to room temperature and then refrigerate it for at least 8 hours, preferably overnight. Process in your ice cream maker according to the manufacturer’s directions. Place the sorbet in a freezer-safe container and freeze at least 4 hours before serving. Luckily we have had a very sunny winter this year. Today was absolutely gorgeous. But I’m still waiting for that winter smack down to return, just as you think spring is around the corner. I’m sure you remember what it’s like! Wow, that is gorgeous! And we do “eat with our eyes” first. I will definitely try this soon. Thanks Karen. I do love the color of this. In fact, I’m wondering why I’m not eating it right now! Looks pretty and surely tastes fantastic. Nice post. If you want to leave out the vodka and still want it easier to scoop, use some corn syrup instead of sugar. Corn syrup has basically the same effect of making the sorbet softer and easier to scoop. Ususally a quarter to half a cup of corn syrup is what is called for in most sorbets without liquor. Interesting. I’ve never made a sorbet that calls for corn syrup. I’m fine with the vodka, or just letting it sit a little longer to soften before serving. And by the way I LOVE your photography. There hasn’t been a post to date that I haven’t thought the photos were beautiful!!! Thanks Marla. That is really sweet. I have lots of fun taking the photos so I’m glad you enjoy them. Had no lavender, vodka or ice cream machine so added no herbs, used sake, and just put the large measuring cup I mixed it in into the freezer and left the spatula in the mix. Returned every 5 to 10 minutes to stir, paying special attention to the sides and bottom of the measuring bowl. It did not take long. Put the serving bowls in and distributed servings to them after they were well-chilled.. It was very good. No need for an ice cream machine. i believe I saw Alton Brown do something similar to set the sorbet but his sorbet recipe said also use a machine so I’m not sure where that idea came from..